We headed towards Krishna Temple post lunch and reached there at 3.30 pm. Krishna Temple is situated very close to Sasivekalu Ganesha idol. 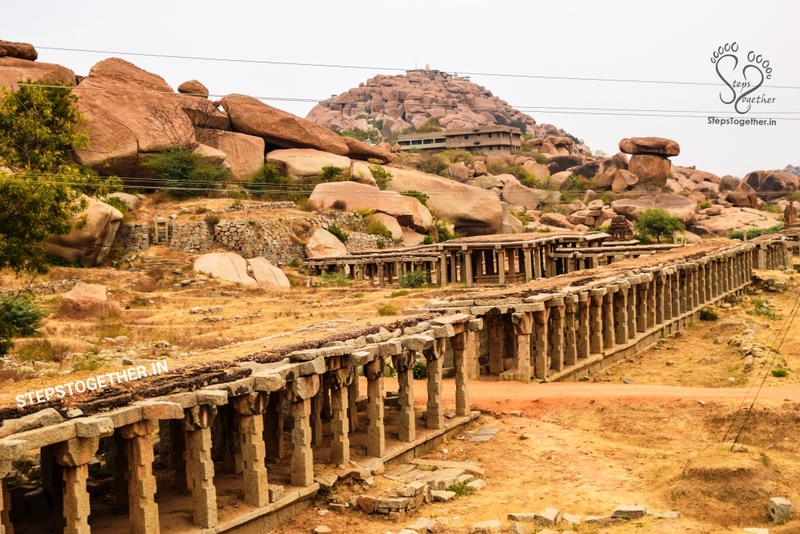 The temple was built in 1513 AD by the most popular king of Vijayanagara dynasty, Sri Krishnadevaraya. It was built to commemorate his victory over Udayagiri kingdom. In ancient days, the temple had Balakrishna idol as the main deity and now the idol is displayed at the state museum in Chennai. This temple is well decorated with pillared corridors, halls, and beautiful carvings of mythical lions. When we visited, the main Gopuram of the temple was under renovation, still we could see that the Gopuram had numerous carvings of various kinds. Infront of the temple, you can see the ruins of market street with long corridors of rock pillars. This is called Krishna Bazar and just like Hampi bazar, gold and other valuable items used to be sold in this market in ancient days. Next to Krishna Bazar, there is a small kalyani (pond). The water from this pond is used for agricultural purposes now. We left Krishna temple complex at 4.10 PM and headed towards the popular Lakshmi Narasimha statue. This huge idol is easily noticeable from the main road itself. The iconic monolithic idol is the largest statue in Hampi. The idol is damaged majorly so much so that people often call it as Ugra Narasimha even though it is a representation of Lakshmi Narasimha. The original idol had the image of Goddess Lakshmi sitting on the lap of Narasimha. 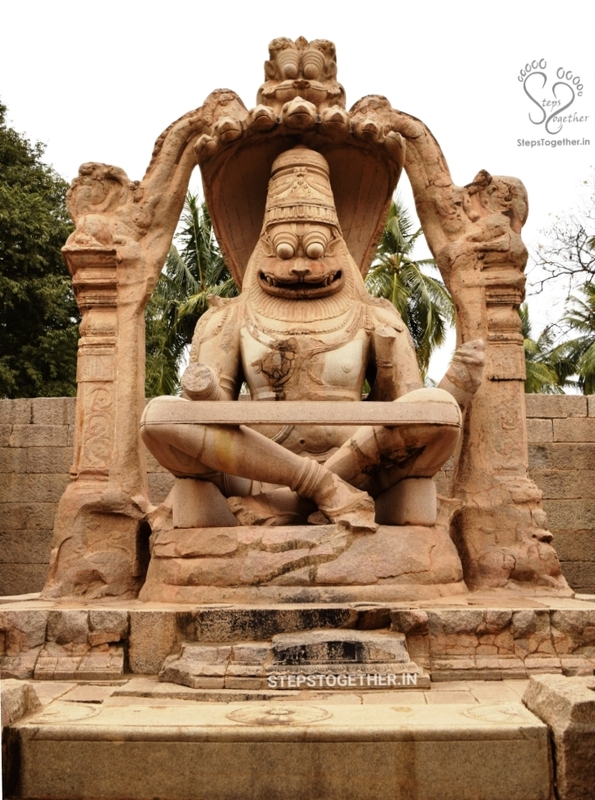 But, the idol of Lakshmi had been completely demolished during the fall of Vijayanagara dynasty and thus making the impression of Ugra Narasimha. It is said that even now we can see the hand of Goddess Lakshmi idol resting on the back of Narasimha. But, you cannot see this because entry inside the enclosure is restricted. Next to Lakshmi Narasimha idol, you can find the largest Shiva Linga of Hampi known as Badavi Linga. It is also housed in a small chamber with only one opening at the front. 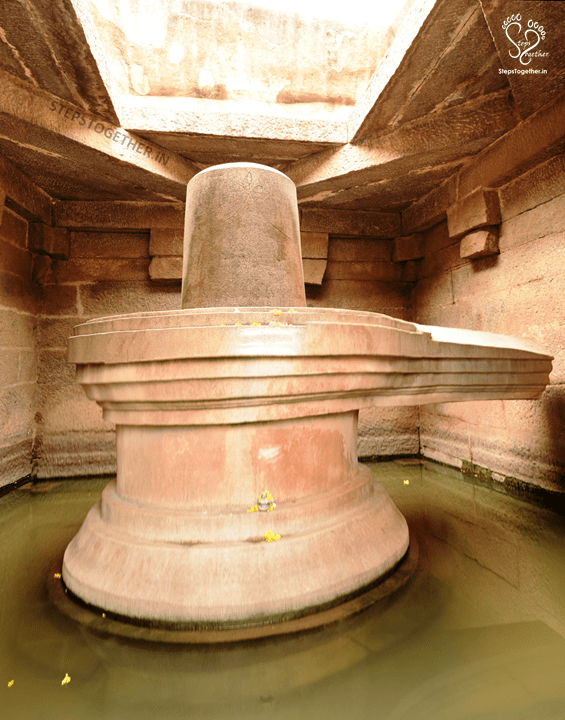 The Shiva Linga is very big and lower portion of the linga is always submerged in water. It is believed to be constructed by a poor woman hence the name Badavi Linga (Badavi means poor lady in Kannada). We left Badavi Linga at 4.30 PM and headed towards Royal Enclosure. Seems a beautiful place to visit and one day I will definitely going to visit it. Thanks for sharing such a nice experience of yours. Wow! That Krishna Temple looks so astonishing and breathtaking. Reading your post and reading your pictures inspired me to add it to my bucket list! Thanks Lydia for your kind words.